K-9 trained dogs can make the best companions in the world, but how do you go from a blissfully unaware pup to a polished, obedient dog? It's all in your technique. Learn about James Larkey's method of training owners so they can teach their own dogs. LoveToKnow Dogs is pleased to have had the opportunity to discuss this topic with James Larkey, owner and professional dog training instructor of K-9 Companion Company, serving the Greater Toledo Area, NW Ohio, and SE Michigan since 2005. James' training inspiration comes from observing world class dog sport competitors in Schutzhund and other ring sports. 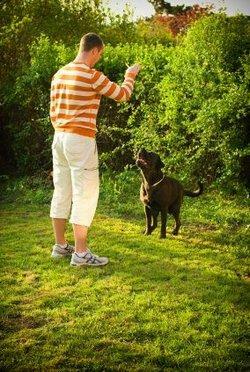 He also has professional dog training experience in kennel management, and has attended numerous dog training seminars. James specializes in working with dogs that display dominant and aggressive behaviors, as well as other extreme behavioral problems. When many new dog owners decide to seek outside help with their dog's training, it's with the idea that it's only their dog that needs training. In fact, owners can benefit from a bit of training themselves. According the James Larkey, it's often better to focus the training on owners in order to teach them how to effectively train their own dogs. This makes sense because ultimately, it's the owners who are going to live with the dogs around the clock. Their canines need to learn to respond to their commands, not a stranger's. Larkey believes, as many trainers do, that foundational training and socialization can begin at eight weeks of age. However, early puppy training is entirely different from standard obedience. At this age it's too soon to begin rigorous training. Proper socialization is the crucial first step toward helping pups develop to their fullest potential. So, once you've made the decision to go ahead with professional training, you have a couple of options. Do you attend group classes at a professional dog training school, or do you opt for private training sessions at home? According to Larkey, "The home is often the hardest area to gain control of your dog. When training in your home, an instructor can better assess the situation and design a customized training session that will help you reach your goals far more quickly". When asked why this is so, Larkey replied, "It's only by seeing dogs interact in their own environments that we can truly understand and solve behavior and training issues. It's far more revealing about the dynamics currently playing out between the person and his/her dog". He's quite right. Most of us are so involved with our pets that it's hard to be objective about training problems when they come up. We're all trying our best, but it's always easier for a knowledgeable outsider to determine where our strengths and weaknesses lay, and show us how to get things back on track. Once this happens, dog and owner are ready to join public training classes as a team. Before you undertake training your dog, it's useful to understand how canines think and socialize. Everything is based on "pack order." This concept involves exactly where each dog falls in the family hierarchy, whether that family is human, canine or a mix of both as you'll find in many households. In a nutshell, each dog jostles for position with the other family members until he figures out whether he's dominant over them or subordinate to them. As it relates to humans, if the dog feels dominant, then he's going to try to call all the shots himself. If you have a dog that snarls at you or otherwise behaves aggressively when you reach for his toys or try to scoot him off your bed, you're dealing with a dominance issue. On the other hand, if your dog simpers up to you with his belly grazing the ground, then your dealing with an overly submissive dog. Either way, you need to tailor your training techniques to effectively deal with the problem. In an ideal situation, you'll wind up achieving loving dominance over your pet. This means you're the boss, but your dog still loves and trusts you because he has no reason to fear you. James Larkey backs up this philosophy by including behavioral counseling as part of his own training techniques. According to Larkey, "While average obedience training focuses on teaching the dog new commands, behavioral counseling focuses on educating dog owners in understanding canine behavior and making lifelong changes in how they interact with their dogs to provide mental well being". Behavioral Counseling: Behavioral counseling goes far beyond just training. It's about getting to the roots of the issues dogs and owners are having so they can reach an understanding, correct behavioral problems in a positive way and be ready to move forward with future training to enrich their relationship. Obedience Training: At K-9 Companion Company, the obedience training programs utilize principles of dog psychology and positive training techniques. 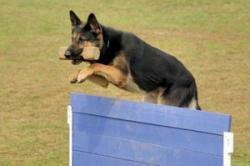 Trainings can be geared to standard obedience or competition-style obedience. Owners can take this type of training and use it to help their dogs earn a Companion Dog title, build on it to get their pets certified as therapy dogs or simply use it to make life with their dogs more enjoyable for everyone concerned. It's easy to see why K-9 trained dogs are such valued family members. If you're going to include a dog in your life, you owe it to him to give him the right kind of training and guidance he needs to be a successful member of your household. 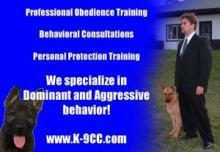 If you'd like to learn more about dog training at the K-9 Companion Company, you can visit their website at K-9CC.com.